Keep your herd happy all through the holidays with these sweet, salty and oh-so-simple popcorn recipes. Our easy Reindeer Crunch Popcorn recipe starts with microwave popcorn. Then choose from 3 varieties of merry mix-ins to accommodate your family's tastes. 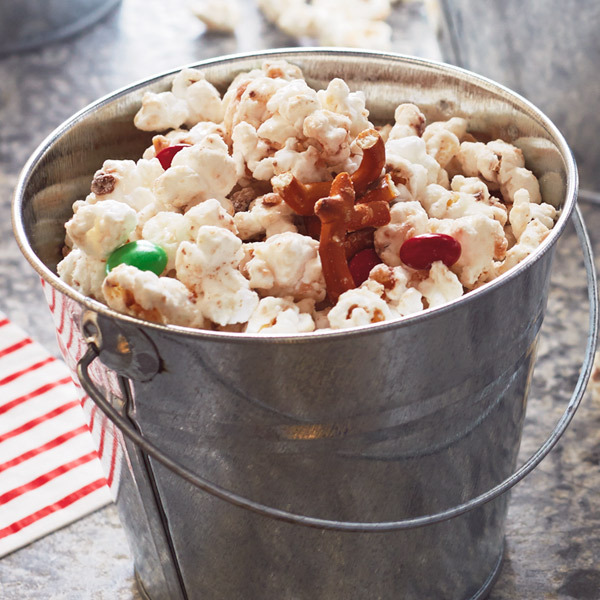 Just be sure to make plenty, because after one bite of this festive popcorn mix, it’s hard to stop! Spread the popcorn in a single layer over a parchment or foil-covered cookie sheet. Melt white chocolate in the microwave, stirring every 30 seconds to prevent burning. If the chocolate is too thick, add up to 1 tablespoon vegetable oil to thin the chocolate to a pourable consistency. Pour the white chocolate over the popcorn. With clean hands, toss the popcorn to distribute the chocolate. Sprinkle with toffee chips. Stir the popcorn every 15 minutes for about 45 minutes to an hour, breaking up any clumps with a spoon or your hands. After the chocolate has hardened, break up the mini pretzels and stir them into the mix along with the M&M’S®. Tip: To remove un-popped kernels from your popcorn, place the popcorn in a bowl, and then cover the bowl with a cooling rack. Tip the bowl upside down over a trashcan and shake. All of the un-popped kernels should fall through. Add cranberries and shelled pistachios for some holiday color. Go nutty and trade out the plain M&M’S® for salted almonds and peanut butter M&M’S®. Trail mix it up with some dried apricot bits and cashews—and replace a cup of the salted mini pretzels with chocolate-covered pretzels.